A solid overall vacuum. Powerful option with a slightly cumbersome design and high price point. Cleans well with minimal fuss. Good suction, ball steering, fairly easy turning, and plenty of attachments designed to remove pet fur from just about any surface you can think of. Bagless design also means you don’t have to worry about buying expensive bags and filters – you can easily empty the canister every time you vacuum. This particular vacuum is not a small one. Many reviewers found it to be a bit heavy and cumbersome, particularly when it came to cleaning tight corners. Additionally, the brush roll sometimes requires manual cleaning every few times the vacuum is used, depending upon the animals in your home. 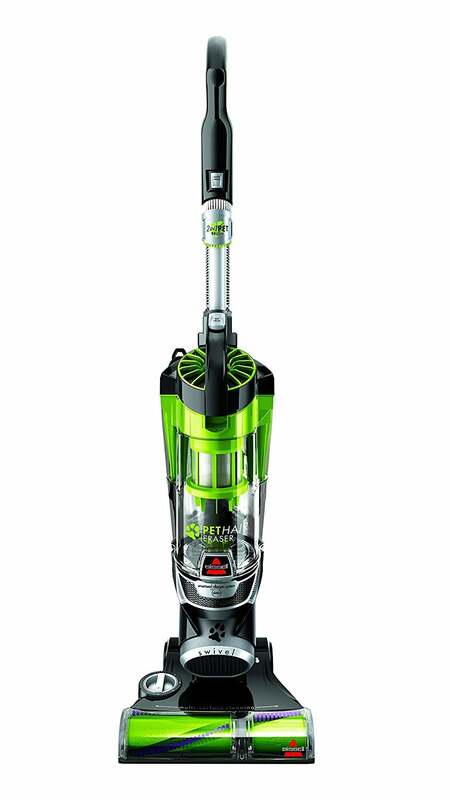 A powerful vacuum with great deep-cleaning action, but it’s also on the heavy side. Great at deep-carpet cleaning. Powerful suction has no problem cleaning even the thickest of carpets, and it comes with a wide array of attachments to help the process along. The big canister also holds quite a bit of debris, which means that you can go longer between each emptying. 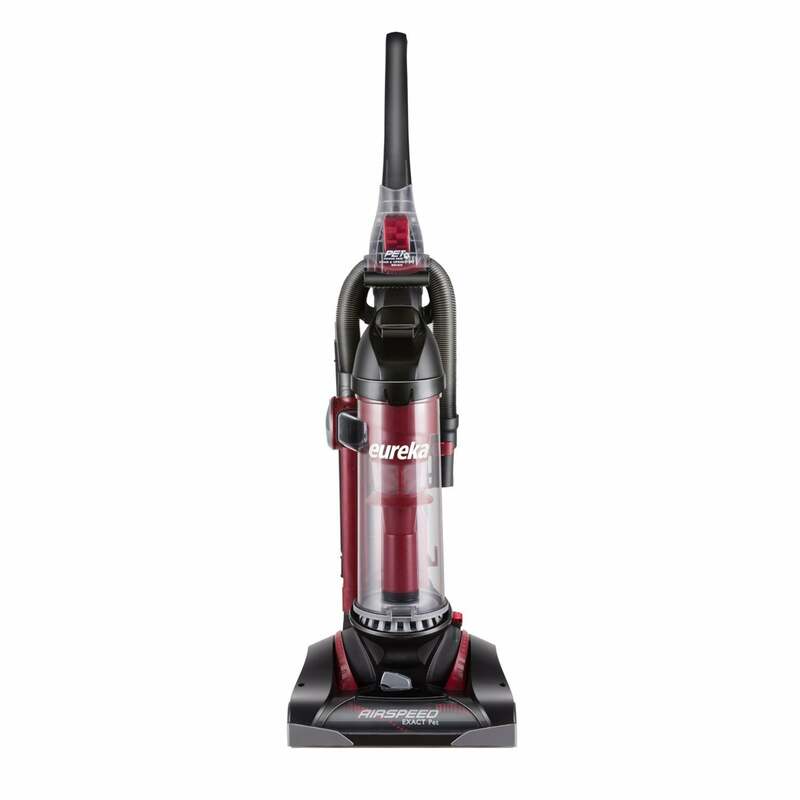 Because it is designed to deliver powerful performance, this vacuum compromises a bit on its ease-of-use. It is a big machine that can take some effort to maneuver, especially across hardwood or tile floors. It is also a bit heavy and can be difficult for children to use. Offers impressive power at a good price point, but trades off for it with its loud operation and heavy weight. A powerful option that offers good suction and a decently-sized canister to help keep you vacuuming longer in between cleanings. Rather heavy and cumbersome to move. This is likely the trade-off for its sheer power, as is the noise it emits. This machine isn’t a particularly quiet one. Does a good job on carpet, but falls a bit short on hardwood floors. 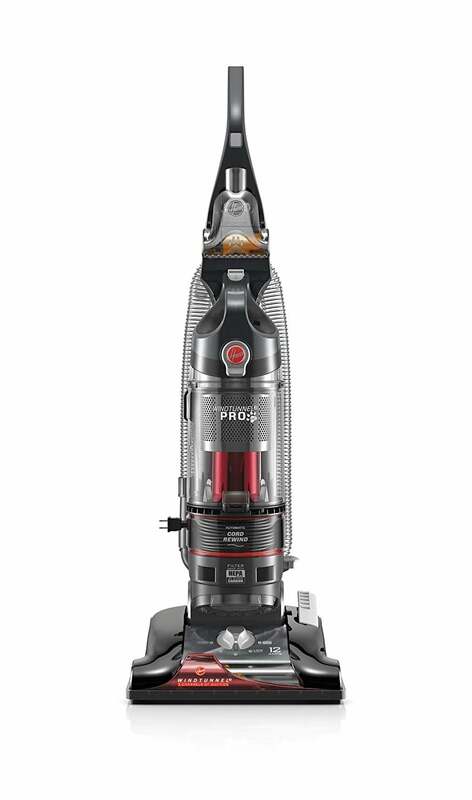 With multiple carpet settings and a variety of pet-hair removing accessories, this vacuum offers a lot to like. Doesn’t quite seem to live up to its price tag. Between its heavy and bulky design and the difficulty it has collecting finer materials from hard-surfaced floors, reviewers found it to be a bit lacking. They also disliked the lack of an extender wand. Picked up pet hair fairly well, but offers poor longevity and durability. With an impressively low price point, the Eureka AirSpeed EXACT Pet Bagless Upright Vacuum Cleaner works fairly well to pick up pet hair on both carpet and hardwood floors. Reviewers were not overly impressed with this particular pet vacuum, mainly citing its lack of durability and easily-damaged parts. Its low price is surely tempting, but it seems as though it might be worth it to spring for a better model if at all possible. Chances are, if you’re a pet owner, your main reason for vacuuming is to remove the overwhelming amount of pet hair embedded in your carpets and furniture. If you’re the owner of a furry friend, you’ll likely find yourself lugging out the vacuum several times a week just to keep up with your dog or cat’s shedding. If you’re going to invest so much time in vacuuming, why not choose a vacuum engineered to clean up pet hair? There are several vacuums on the market that claim to be the best vacuum for pet hair, but determining which is really best can be challenging. That’s why our team at House Method researched a variety of vacuums to determine which is best for pet hair. We analyzed thousands of reviews to help synthesize the most important information about each model, and we’re happy to share our findings with you. If you’re a pet owner, pet foster parent, dog sitter, or are in any position in which animals are frequently in your home, you’re probably familiar to dealing with the fur they shed. If you check the contents of your vacuum dust canister (especially in the summer months), it most likely comprises pet hair. Choosing a vacuum that is specifically designed to remove pet hair will noticeably improve your vacuum experience. Vacuums designed for pet hair will also help when it comes to cleaning other pet debris. These vacuums often come with attachment parts that are engineered to remove hair, dust, and debris without entangling the brush or clogging the filters. The two most common are probably canister vacuums and upright vacuums, however, other potential designs include handheld models and autonomous models. Upright vacuum cleaners are perhaps the most common kind of vacuum cleaners on the market. These machines consist of a single unit that houses both the suction head and motor. A canister vacuum, on the other hand, consists of the suction nozzle attached to a long wand that is linked to a separate canister into which the dirt you suction is deposited. These are the vacuums that are often wheeled behind the user as they move from area to area. Upright vacuum cleaners are generally cheaper than canister vacuums. They are also usually a bit louder than canister vacuums but offer a wide cleaning path as a trade-off. Canister vacuums tend to be more powerful than their upright counterparts and are easier to use in tight corners or on stairs. Finally, you should also determine whether a bagless or bagged vacuum cleaner is the right option for you. Bagged vacuums are often considered a bit more hygienic than bagless due to the presence of an airtight bag that traps debris and dirt, even when you’re changing the bag. Bagless cleaners, on the other hand, require you to pull the compartment holding debris and dirt out of the vacuum cleaner and empty it manually. This can lead to more exposure to allergens, however, it is often less expensive and more eco-friendly than bagged options. What kind of floor do you have? The answer is important when it comes to choosing the best pet vacuum for your needs. In general, the majority of pet vacuums are designed specifically to pick hair up from carpeting (and, in some instances, upholstery). This means that they can sometimes falter when it comes to adequately cleaning hard floors. There are vacuums that offer good dual-functionality via a special brush roller or suction mode that can be activated or deactivated when switching between floor types, but it’s important to pay attention to the details of the vacuum in question. Some machines handle this switch better than others. One of the most important factors to keep in mind when looking at pet vacuums is the size and weight of the machine. In general, these types of vacuums tend to be heavier than traditional vacuums. This is especially true when we look at pet vacuums designed to be bagless. These machines require a lot of power to tear through pet hair and leave your floor nice and clean, so it’s no surprise that they tend to be heavy and large. Make sure to look at the specifications of the vacuum you’re considering before you purchase it so that you aren’t surprised. Something else to keep in mind with pet vacuums is the kind of attachments included and whether or not they fit your needs. If you are looking for a vacuum that can double as an upholstery cleaner, for example, to rid your furniture of pet hair, then you’ll want a machine that comes with attachments or settings specific to that need. You don’t have to settle for less – there are many different vacuums out there that come at all different price points and offer a wide range of attachments. Because pet vacuums can be heavy and cumbersome, it’s important to familiarize yourself with your vacuum and work with it, not against it. That means understanding how the machine turns, how to change its settings, and how to best remove and empty the canister. You might be surprised at just how much effort you must put into moving the vacuum on hard floors, too. Just pay attention to the vacuum and don’t try to fight it or force it into areas too small to easily move around in. Don’t underestimate the weight of these vacuums – the last thing you want to do is to hurt yourself. Keep an eye on the brush roll of your vacuum. Even if it is designed to be used by people to vacuum up hair, clogs and tangles are not a thing of the past. This is just how the technology works. You can limit your frustration, however, by keeping an eye on the situation and acting before it becomes necessary. Are bagless pet vacuums less powerful? Bagless pet vacuums can be just as powerful as more traditional pet vacuums. Technology has come a long way! Just make sure that you don’t forget to empty the canister after you’re done. How much should I spend on a pet vacuum? The price point for pet vacuums varies wildly. You can spend as much or as little as you’d like depending upon your specific needs and expectations. If you’re looking for a solid machine that is built to last, you can probably expect to budget around $200 for one – but there are more expensive and less expensive models on the market. Know what you need before you make a purchase. Can’t I just buy a “normal” vacuum? If you’re hoping to keep your home free of pet hair, you really should invest in a pet vacuum. These machines are specially designed to withstand the wear and tear that fur and dirt can wreak – normal vacuums are not. A spot cleaner can be the difference between carpets you’re proud of and floors that you’d rather hide than show off. Let us help you select the right one for you. Pushing and pulling a big, plastic machine over precious hardwood floors is a scary thought. That’s why we turned to verified customers to lead the way in our search for the best vacuum for hardwood floors. Read more here.